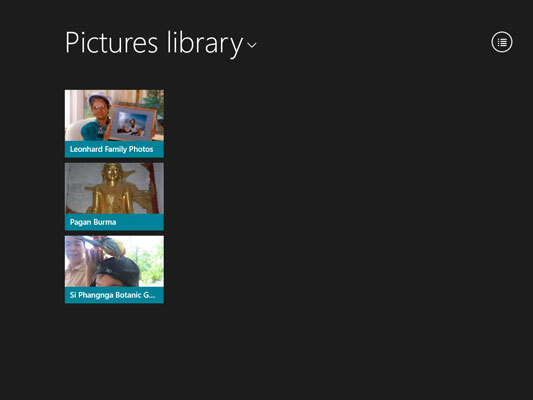 The Windows 8.1 Metro Photos app has a very, very limited picture-import capability. 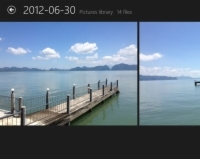 You’re much better off using Windows Photo Gallery or any of the many photo apps. 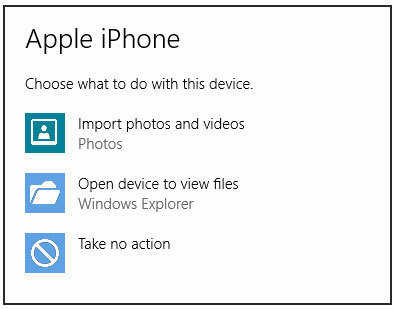 1Tap or click the Photos tile on the Start screen. The main Photos page appears. 2Plug in your phone, camera, USB drive, SD card, or external hard drive to your computer. Windows probably shows you a toaster notification. Depending on what kind of camera you attached, you may get a generic notification that says something like, Removable Disk (X:) / Tap to Choose What Happens with Removable Drives. (X is the drive letter.) Or you may get a more specific notification. 3Tap or click the notification. If the notification appears and then disappears too fast, just unplug the device and plug it back in again, but this time have your mouse or finger ready to pounce while the dern little thing is on the screen. 4If you’re feeling very brave, and the option is offered, you can tap or click Import Photos and Videos. If you aren’t feeling so lucky (remember Dirty Harry? ), choose Open Folder to View Files and continue to Step 5. Windows flips to the desktop and opens the drive. 5Note the drive letter that appears on the File Explorer location bar next to Removable Disk, and then go back to Photos. To return to Photos, you may need to tap the Windows button on the tablet or press the Windows key on the keyboard. Then tap or click the Photos tile. 6Swipe up from the bottom of the screen or right-click the screen. The App bar appears at the bottom. 7Tap or click the Import icon on the right. Photos responds with a Choose a Device to Import From pane, which contains a list of external devices, many of which probably don’t exist. 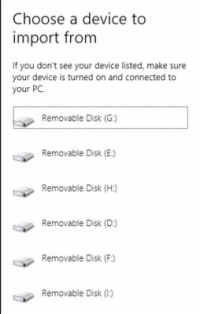 8Tap or click the drive letter that corresponds to the device you plugged in to the computer. 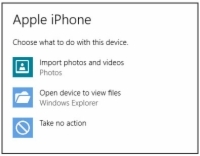 The Photos app scans the phone, camera, or drive and then shows you all the pictures that it found. 9If you want to import all the pictures, leave them selected. If you want to select individual pictures to import, tap or click Clear Selection and then select the pictures you want to go into your machine. 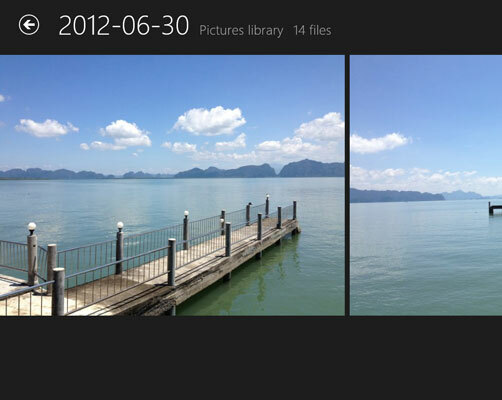 Photos does not delete any pictures that it finds. They’re still on your camera or external drive, gathering dust — or at least taking up space — until you go in with a real tool, such as File Explorer, and delete them. 10Type the name of a folder that you want to create to hold the pictures. This folder is actually placed in your Pictures folder, if you need to find it in the future. Because the folder is in your Pictures folder, the folder appears as a separate folder in the Photos Pictures library list. 11When you’re happy with the selection and with the folder location, tap or click Import. 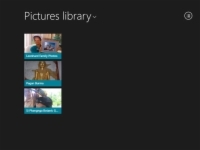 The Win8.1 Photos app dutifully imports the pictures — without deleting them on your camera or external drive — and sticks them in the indicated folder, tells you you’re done, and then offers to open the album. 12(Optional) Tap or click Open Album. 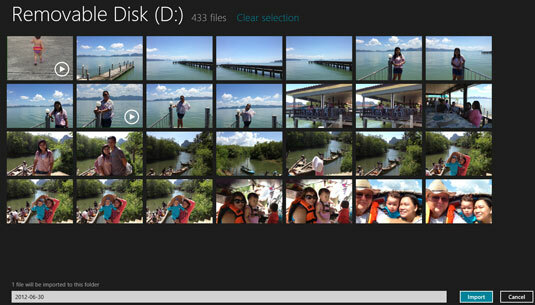 The Photos Pictures library list appears, with the imported folder open.